Do you think it’s too late to make your debut as a singer? Read my story to see why singing for seniors is a great retirement hobby. There were no singers of note in my family, though my older sister was handy with the sewing machine. School was where my musical ambitions were fostered... and faltered. It didn’t begin well. I was very disappointed to tell my parents that I had been given a triangle in the North Presentation Convent school band, which I only got to strike on the odd occasion during a performance. I envied the boys who played flutes, cymbals or drums. My introduction to singing was at the North Mon, when my class entered the Cór Fhéile, a musical festival for primary schools. The choirmaster would check the pitch by striking a tuning fork against his elbow, and the hum became audible when he rested the base of the gadget on a wooden bench. And away we went, in perfect harmony, or not. When he came and stood close to me, my throat tightened... ‘Sing up Butler, I can’t hear you’, which was often followed by ‘you’re off key you amadán’. I was a joiner of clubs and societies- the boy scouts, the Legion of Mary, the Angelic Warfare, the boy’s Confraternity, sports clubs, Cadbury’s C-cubs, and comic book clubs. So it was no surprise to my parents when I announced that I was joining Cork’s renowned North Cathedral choir, conducted by the distinguished Bavarian organist, Aloys Fleischmann. I was aged ten, and hadn’t any choral experience, apart from the aforementioned Cór Fhéile, two years earlier. In between there was a bit of street singing with my pals. 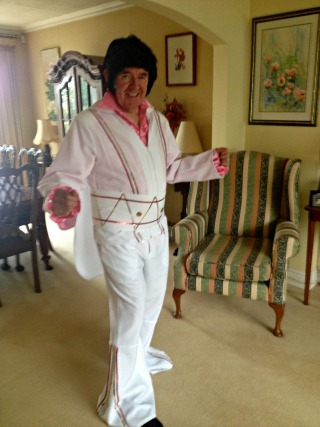 I envied Pat Nolan’s impersonation of Elvis, and he impressed the girls. At the North Chapel, as we called the Cathedral, there were about thirty boys ahead of me. I didn’t realise there would be an audition. And just like in X Factor, one by one the boys performed, with varying degrees of success. I got anxious as I got nearer the head of the queue. When my turn came, I froze, ‘my hands were shaking, and my knees were weak’, my tongue got tied when I tried to sing. Mr Fleischmann told me, in a kindly voice, ‘come back next year’. I was all shook up. I didn’t go back next year, and ‘hid my lamp under a bushel’ for a very long time. When I was forty I took some singing lessons. I got the name of a highly regarded teacher, and when I phoned her I explained that I didn’t sing, and didn’t know if I could. I might be tone deaf, or just a bad singer. The lessons went well. I mainly learned Irish ballads and Victorian parlour songs...Danny Boy, The Mountains of Mourne, Loves Old Sweet Song, and Just a Song at Twilight. But I rarely sang them outside of the lessons. 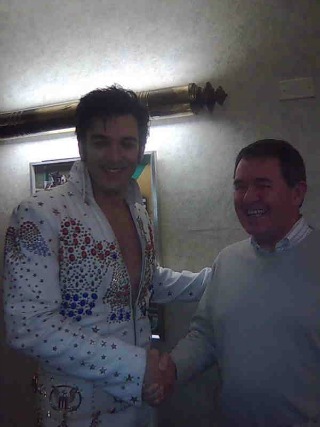 And my secret ambition was to sing Elvis, on stage! My golf club puts on a high quality two night variety concert every year, based on particular themes, for example songs from Broadway shows. I envied the performers, but thought I could never do that. 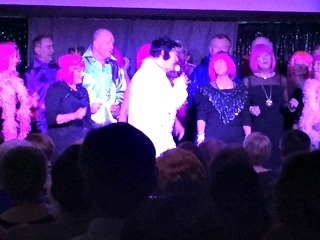 This year the theme was Viva Las Vegas with songs by The Rat Pack (Frank, Dino, and Sammy), and of course ELVIS. A medley of the King’s songs was a feature of the show. I received an email, as did all members, inviting me to rehearsals. Crucially, there was no audition, and the invite stated that ‘enthusiasm was more important than talent’! I was happy to join the chorus, but after a few rehearsals, I suggested to the Producer that he consider adding one of the King’s greatest hits-All Shook Up. ‘We don’t have anyone to sing it ‘, he replied, ‘can you sing it?’ Can I sing it? I’d been rehearsing it since I first heard Pat Nolan perform it in Lower John Street in 1957! My moment of destiny had arrived. On the night of the show, I wore a white sequined suit and cape, flared trousers with a large studded belt to camouflage my gut, black wig with big sideburns, and a pink frilly shirt. With an eight piece orchestra, and the backing of 35 accomplished male and female singers, and my Elvis costume, I was winning before I even opened my mouth. I sang with gusto, and moved my pelvis as much as my aged body would allow, and when, at the song’s conclusion, I dropped to one knee in true Elvis style, well let’s just say the audience was stirred. For two minutes that night I was the King. The show went well...I can’t wait to ‘come back next year’!